March 2007 – Beverley's journey..
No problem the gentleman who served us was most helpful and we had our 1 litre of paint so off to the till with me carrying it to pay…!! Just as we arrived at the till I dropped the tin and the lid came off green gloss paint in one big puddle on the floor with splats of it everywhere including my shoes!! So hence the reason for my title!! Thank goodness we hadn’t paid for the paint…so whilst I stayed with the puddle of green paint trying not to look too embarrassed as shoppers skirted around it DH went back to get another litre made up. Whilst he was gone I had 7 B&Q very nice men all standing around looking at the puddle of green paint making silly comments whilst one very young man was on his knees trying his best to clear it up. Needless to say I won’t be going into B&Q for awhile!!! With the beautiful weather we had at the beginning of the week I didn’t want to miss out on playing golf on Tuesday and what a super day it was…we don’t need to talk about the actual golf…but the weather, scenery and company was excellent and it was nice catching up with other ladies in the club house afterwards for a cup of tea and chat. That was Tuesday and on Wednesday DH had an appointment for a check up and then we went out to lunch and in the evening I went to a Fashion Show. So as you can see I’ve been really busy enjoying myself. As some of you may remember I joined a photography forum and decided to try a little macro work with my DSLR camera. 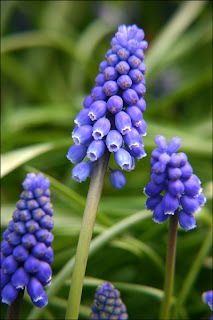 Having put my photo of some Grape Hyacinths which are growing in my garden in the gallery on the forum site I’m so pleased to say I have received very encouraging comments and this is the photo! Yesterday on our way out to lunch we drove by The Mountnessing Post Mill. The Mill is about 5 miles from where we live and over the 30 years we’ve lived here we have never stopped by or been inside it. However yesterday the sun was shinning and I just happened to have my ‘baby camera’ in my bag so we stopped for me to get a photo and here it is…by the way the Mill was built in 1807. Thanks everyone for stopping by and leaving your comments, much appreciated. Ok I know I had a lot on this week but I really can’t believe it has rushed by so quickly. The beginning of our Spring weather wise hasn’t exactly inspired me to rush out with my camera to take photo’s as I had hoped. In fact because I was busy all week I had set aside Friday to go out with the camera to experiment with a few tips I had picked up from the new photography forum I have joined…but oh no the weather let me down and it was a dull, grey, damp and cold day. but who knows maybe next week will be better. One of the reasons why the week and every week ahead is busy is because I think I have become involved in too many things!! I think I need to sit down and reflex on which forums and interesting sites I really want to be with and perhaps I have to pull out of a couple to take some pressure off and allow me to give more time to the ones I enjoy and feel comfortable with. I’m a person that believes that if you join something you are making a commitment and therefore should make time to give and be involved, however sometimes you just have to pull back!! So on that note I will now go off to bed to finish it…. Thanks as always for visiting and I appreciate all the comments left. I hope your not going to get bored with these photo’s but until the weather improves and I can get out and start taking some more photo’s I’m afraid this is it, although I will try and make my blog more interesting by posting up the occasional layout that I’ve done for DSSA. 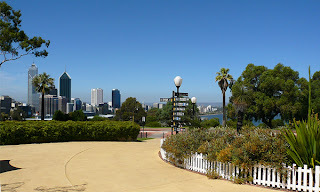 Today’s photo is taken from Kings Park in Perth and although in my opinion not such a pleasing park as the Botanical Gardens in Sydney it most certainly has a charm of it’s own and of course because of its position we were able to get such great views across the city. 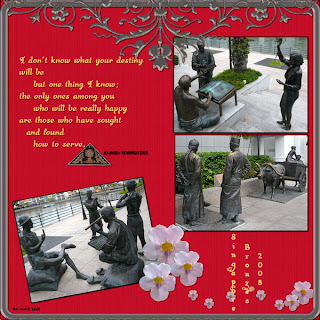 Looking back on my blog you will recall I posted some photo’s of the bronze statues in Singapore and these were the subject of my layout posted on the DSSA site so I thought you might like to see what I did with them!! Well closer to home it was very pleasing to wake up this morning on the first day of Spring to a beautiful blue sky, and the sun shinning but I must say it was very chilly. Anyway as I said to my husband from today onwards no more conversation including the word ‘winter’ that is now in the past and we go forward to what I hope will be a lovely warm Spring and great summer. 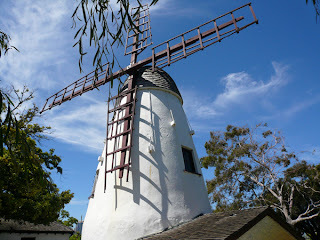 and one of the most interesting places we visited during the first days of our stay was to The Old Mill in South Perth. 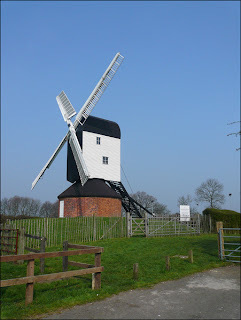 As you will see from the photo a beautifully restored Mill that is now under the ownership of The National Trust. The original Mill was built in 1835 and was a working Mill until production was stopped in 1859 and then followed a very ‘colourful history of events’ until work was started to restore it to its former glory and it was then vested to the National Trust in 1992. So a little about the weekend. A busy time with shopping and trying to do some odd jobs around the garden which was at the time in the hope that Spring was around the corner…how things change!! Today Sunday it has been sunny but very windy and so cold. We have a forecast for snow showers tomorrow and all those lovely buds and leaves that are appearing may well have to step back for awhile. One of the other things I did this weekend was join a photography forum. I feel I really must make some progress with my photography otherwise I’m always going to be stuck in ‘Auto mode’ and what is the point of having a camera with other options if I don’t use them. Also because of my new handy little camera that goes every where me my dear faithful DSLR is in danger of never seeing the light of day again. So it’s early days yet but I feel very comfortable with the forum and they have made me very welcome the rest is now up to me!! 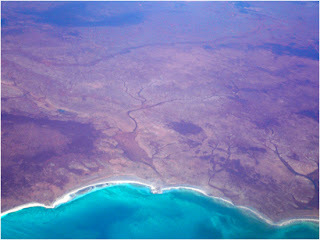 So I’m going to continue today with our journey to Perth and shown here are two photo’s taken from the plane. 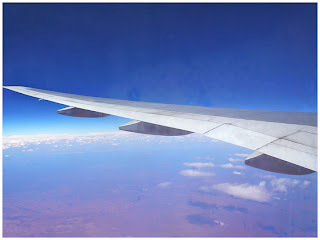 The one shows us arriving over the Australian land and the other is just to show you the beautiful sky as we were getting close to Australia. It was such a vibrant blue it seemed unreal! The photo’s were taken with my new ‘small’ camera bought in Singapore. It’s a Panasonic DMC-FX07 and what a gem it is. Although I had with me my Canon DSLR complete with lens, filters etc I didn’t use them once as I went everywhere with my new ‘toy’ which fitted into my pocket so easily. Following on from an earlier post you may recall that I made a decision that from now on I would not go anywhere without a camera with me. So many times I have lost a photo opportunity just because a camera was not to hand and this proved the case with my photo of the Magnolia Tree as without this little gem in my pocket I would have missed the chance. so quickly after coming back from hols. My diary is filling up with things to do and people to see. Don’t get me wrong I’m not complaining because I know I’m lucky to firstly be able to do these things and secondly to have things to do and friends who want to see me, but I just don’t seem to have enough hours in a day. Anyway as it is another lovely sunny Spring day here where I live I decided instead of getting in the car to go to the shop to buy some fresh fruit I would walk there to get some exercise and of course I never go anywhere now without my little camera. 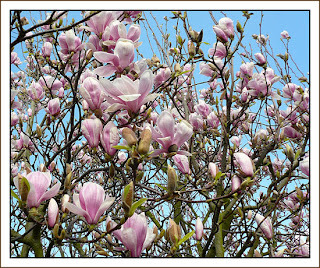 I took this photo of the Magnolia tree that lives in a garden along the way to the shop. It mainly hangs over the edge of the pavement so I was able to take my photo without having to ask the owner and of course with the lovely blue sky it shows it off so well. Yesterday I was really pleased to play a round of golf as having been away for a month and with not having had good weather at the beginning of the year I’d missed out on playing and getting my weekly exercise. Not much to say about my golf except ‘room for improvement’….which I hope will happen in the coming weeks!! Thanks for all your lovely comments and as always they are very much appreciated. I’ll now get back on track with some more photo’s from the holiday.